Manfuactured by E+E Elektronik and now available from ECEFast , EE33 series transmitters are designed for fast and reliable measuring of a number of climatic measuring quantities under the most demanding conditions. 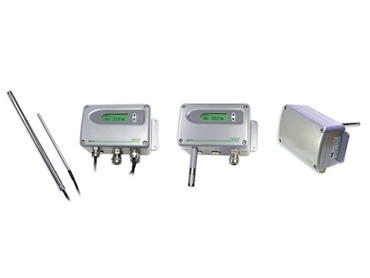 These transmitters measure relative humidity, dew point temperature, absolute humidity and six other climatic measuring quantities. They are unaffected by condensation or heavy chemical pollutions, and capable of process pressures as high as 100bar (1450psi). Continuous high humidity is also not a problem for the EE33 series. The core of these new transmitters is a new monolithic measurement cell type HMC1, manufactured in thin-film technology by E+E Elektronik. The innovative design of this measurement cell ensures that chemical contamination and condensation will evaporate. The monolithic construction of the sensor allows a fast return to normal conditions and a continuation of the measurement. In addition, with the inimitable E+E sensor coating the HMC1 measurement cell is even better protected against corrosive and short-circuit-causing conductive soils. measurement of relative humidity at process pressures up to 100bar (1450psi). measurements in fields of process automation, sterilisation and autoclave processes.